This is the weight vest we use at MTI. The weight is positioned high on the front and back of the torso for better carriage, and straps tightly with a buckle and velcro system to minimize movement. 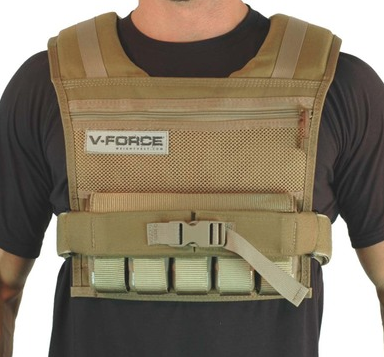 The company provides a weight vest trade-in for your old vest (great for coaches and gym owners) which provides a $35 credit towards your purchase. It also comes with a lifetime warranty, so if something breaks, they’ll send you a replacement. After seven years of pounding our vests, some of the stitching came loose on a buckle. Weightvest.com shipped new ones at no cost. Active Shooters: Patrol tasked to respond, but are they out-gunned, under-equipped, and under-trained? And what does this mean for SWAT?